Like that great Hollywood subverter Howard Hawks, director Richard Linklater (Boyhood, the “Before” trilogy) builds his movies out of meandering, easygoing conversations. A more relaxed filmmaker at work today doesn’t exist. 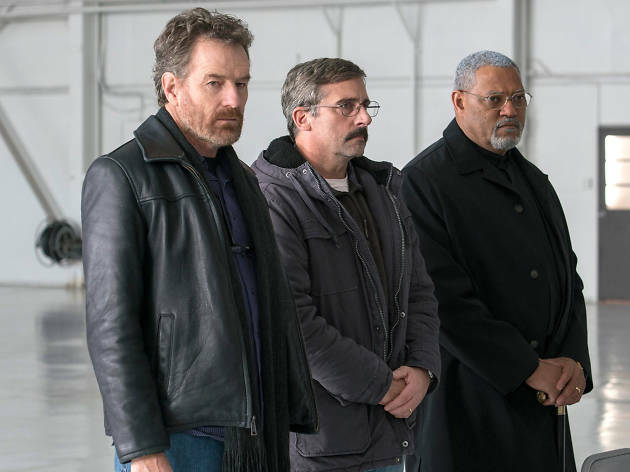 Last Flag Flying is probably the only kind of war picture Linklater could make—a drama devoid of helicopter raids and explosions. Instead, it surfs the prickly tensions sparking among three graying Vietnam War vets, the pugnacious chatterbox Sal (Bryan Cranston), the rehabilitated warrior turned reverend Richard (Laurence Fishburne) and the runt of their violent years, the meek “Doc” (Steve Carell, in an outstanding career revision). You needn’t have seen Hal Ashby’s 1973 The Last Detail to appreciate the subtle interplay being brewed here (variations on these characters were already explored by novelist-screenwriter Darryl Ponicsan). Best to meet them as we do, first in a dive bar owned by Sal, then on a road trip to a military hangar where the body of Doc’s son, a Marine who fought in Iraq, will be returned to him. 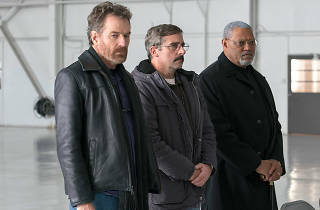 Last Flag Flying arrives at a terrible moment of timeliness, when the subject of military grieving and callousness from higher-ups dominates the news. In that regard, it plays like one of Linklater’s most intimate gifts, an adult rumination on the tricky subject of patriotism. These men feel something beyond their brotherhood: a pride in a country that doesn’t deserve it. It’s a major film pitched just above a whisper.